Analysis: Clinton Needed Pennsylvania to Carry On Winning the Pennsylvania primary by a double digit margin has given the Clinton campaign at least two more weeks' lease on life. The New York Senator can now connect her win to her victories in the Ohio and Texas primaries to justify continuing her bid. Sen. Hillary Clinton may not have gotten everything she wanted from the Democratic primary in Pennsylvania, but she got what she needed. Winning the largest state left on the calendar — by a double digit margin — gave the Clinton campaign at least two more weeks' lease on life and legitimacy. The New York senator can now connect her Pennsylvania win to her March 4 victories in the Ohio and Texas primaries to justify continuing her bid and claiming momentum in the race for the party nomination. She can also use the symbolism of the city that gave rise to the "Rocky" movies to cast herself as an underdog and a comeback competitor. Despite his recent travails, Sen. Barack Obama of Illinois continues to lead in the delegate count, especially among pledged delegates. "Some counted me out and said to drop out," Clinton told cheering supporters in Philadelphia, some of whom wore boxing gloves and headgear. "But the American people don't quit, and they deserve a president who doesn't quit, either." And then she made her bid for the applause line of the night and the headline for the morning: "Because of you, the tide is turning." Turning the tide was exactly what Clinton hoped to do in the Keystone State, perhaps the best showcase for her electoral strengths outside her home state. In Pennsylvania, only registered Democrats could vote, and the established Democratic electorate was older, whiter, more Catholic and more working-class than in most of the primaries to date. Clinton enjoyed large advantages in each of these demographic groups. She also dominated the vote among women, as she has through most of the primaries. Women cast about 60 percent of the votes in Pennsylvania. Obama won overwhelmingly among African Americans, and had 3-to-2 advantages among voters under 30 and those casting ballots for the first time in a Democratic primary. Clinton held off the appeal of the new partly with the help of key figures in the state's power structure. These included the popular Gov. Ed Rendell; Philadelphia Mayor Michael Nutter, an African-American who introduced her at the victory rally; and veteran Rep. John Murtha, a congressman from Johnstown. The force of these assets held off the concerted effort of the Obama campaign, which sensed a chance for an upset in this state that would clinch the nomination. Using a big fundraising advantage, Obama spent $9 million on TV ads, swamping the Clinton push on the airwaves. He contested the white, working-class base that had favored his rival in Ohio and most other industrial states. In recent weeks, these thrusts had reduced Clinton's margin in Pennsylvania from the teens to the mid-single digits. But in the final 10 days, Obama's momentum stalled shy of the goal. Controversy over his onetime pastor in Chicago, Rev. Jeremiah Wright, Obama's own comments about bitter small-town voters and, finally, a lackluster debate performance April 16 combined to cast fresh doubts on his candidacy. These vulnerabilities dominated media coverage of the Pennsylvania contest in its final weeks. In exit polls conducted for the Associated Press and the major news networks, one-quarter of the voters said they had decided in the final week and reported breaking for Clinton by nearly 3 to 2. The Clinton camp had hoped for a blowout win to signal the collapse of Obama's upstart candidacy and its once potent appeal. But by holding her margin of victory to the Ohio level, Obama was able to reduce his rival's payoff in terms of pledged delegates to the nominating convention. Pennsylvania had 158 delegate slots at stake on April 22, and preliminary calculations indicated that Clinton would get roughly 10 more of these than Obama. That won't make much of a dent in the pledged delegate advantage Obama has enjoyed since February, which stood at about 160 delegates as Pennsylvania went to the polls. Clinton now must build on the success of her Pennsylvania victory. The first challenge comes in two weeks, when Indiana and North Carolina hold their primaries. Together, the two states offer about 30 more delegate slots than Pennsylvania. And while Obama has enjoyed a large lead in North Carolina, Indiana is viewed as a toss-up. In percentage terms, Indiana's white population is slightly larger than Pennsylvania's, while the African-American population is slightly smaller and the Hispanic slightly larger. And while the state is much like Ohio and Pennsylvania in voter profile, it also borders Illinois and feels the influence of Chicago and its media. 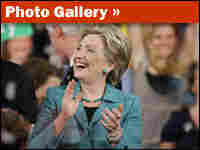 Polls there had favored Clinton until recently, when two polls showed Obama with a small edge. If both the May 6 states go for Obama, there will be renewed calls for Clinton to end her campaign. Her latest financial report showed that she spent more in March than she took in, while Obama's contributions outpaced outlays by more than $10 million. Cash on hand favored his campaign over hers by a ratio of about 4 to 1. But Senator Clinton, who made a direct appeal for money in her victory speech in Philadelphia, hopes a win in Indiana would propel her through the remaining contests in West Virginia (May 13), Kentucky and Oregon (May 20), Puerto Rico (June 1), Montana and South Dakota (June 3). She is now favored to win at least West Virginia and Kentucky. At the end of this road, the former first lady must appeal to superdelegates, the elected officeholders and party officials who vote at the Democratic convention by virtue of their positions. She will need a substantial majority of the nearly 800 superdelegate votes, far beyond her current advantage of fewer than 30. The Clinton campaign hopes that additional blows against the Obama candidacy will help turn the final voting events in her favor, making a case for overruling the judgment of the pledged delegates.